I know what some of you will be thinking... SEPTEMBER for a CHRISTMAS gift guide?! But to my defence, the Disney Store has had their Christmas decorations out for ages now, so really you could say that I'm quite late with this. Ahem. Although it is a tad early I've already been seeing so many lovely Disney bits around that would make perfect low-budget Christmas gifts so I thought I'd share them with you today! Primark always have the loveliest selection of Disney pyjamas but I especially love this set. Monsters Inc will always have a special place in my heart but unfortunately you don't tend to see too much merchandise with the characters on so this set makes a nice change! This collection of Disney books is so stunning. I have two of them and the illustrations are incredibly beautiful and colourful. I've seen them range in price quite a bit, they're usually under a tenner but I've seen them as low as £2 so it might be worth shopping about a bit first if you're after one of these. These have such a sweet design on them - although you can't really see from image above above they have Alice dreaming "I would rather be in Wonderland". And c'mon, if you don't recieve at least one pair of socks for Christmas, is it even Christmas?! When I did my Disney Christmas gift guide last year I did it for items that are £10 are less, but with this beautiful journal coming in 99p over budget I had to change this year's post slightly to include it! I actually treated myself to this recently and I can honestly say that it's even more lovely in real life. The included pencil even has "listen to your heart" printed on it which I think is so sweet! Penguin Random House Children's UK kindly contacted me a few weeks ago to ask if I would be interested in receiving a sample copy of this and as soon as I saw the email I jumped at the chance! I grew up on the vintage Ladybird books so I think this is the sweetest idea to give the books a fresh lease of life by turning them into colouring books! This would make such a good gift for any Disney fan, I've had so much fun with mine! I'm all about anything that's rose gold so when I spotted this beautiful bauble on the Disney Store's website it went straight on my Christmas wishlist! OMG it's all so cute! 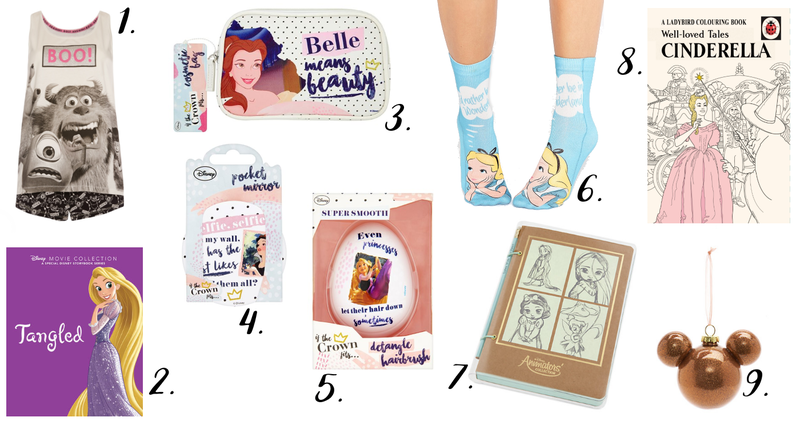 The Belle beauty bag is so cool. I need to get my hands on one of those animators journals too : ) Great post!